Are you wondering how to get started in trading? Here are the steps everyone will want to take to get started in trading stocks, ETFs, or options. Should I Trade Stocks or Options? Do You Want to Trade ETFs Vs Stocks? Is It Better to Trade Options or Futures in the Beginning? How Much Time Does It Take to Learn to Trade Stocks? The first, and maybe most important, step to get started in trading is to make sure your trading activities are in alignment you’re your overall wealth plan. Whatever you do, don’t allocate more money than you can afford to fund your trading account. In fact, I suggest starting with very small amounts until you have some success with trading. Only you can determine the amount of your investment account that you want to allocate to your trading account. Many traders begin by allocating 3, 5 or 10% to their trading account. There are multiple variables to consider, such as your net worth, risk tolerance, goals and overall wealth plan. Consider, too, if your plan is to generate monthly income from collecting option premiums vs capturing capital gains based on shorter-term market swings. Read more about this below. Also, as explained more below, the brokerage firm you choose will require a certain level of capital in your trading account once you become established as a trader. You allocation, therefore, will need to be over the minimum required. With all of this in mind, allocate a set portion, specified in percent and dollars to your trading activities. As you become confident and successful trading, you can gradually increase the amount of capital in your trading account. Above all, decide on a sensible allocation toward trading, and stick with it. Never, ever impulsively add funds from your investment accounts that have been allocated toward long-term savings to your trading account. Practice financial safety and discipline first and foremost from the very beginning when getting set up to trade. This is sound risk management, which is a huge emphasis in all my work here at Power Cycle Trading. After you’ve decided how much money to allocate to trading, you’ll want to make some decisions that will direct you in how to get set up as a trader. You’ll see what I mean by answering the questions below. This is one of the most common questions for beginner traders. While both stocks and options are securities, there’s no denying that stocks are simpler than options. A stock is a stock, and that is very simple to understand. An option, on the other hand, involves many factors. An option is a contract that allows owners the right to buy or sell an underlying security within a specific time frame and at a set price. Having said that, options offer a big advantage in that they are much cheaper than stocks to trade, so a lot of traders like to start trading options. Here are a just few of the options basics, for example, that you’d want to fully understand before you trade options live. Before trading options, a trader will want to fully understand how option pricing works to make safer and higher probability trades. For example, owning an option has an added risk element over selling an option. This is one of the first things I like to teach in my options programs. Another important factor to know is how and when options trade. Knowing this will affect your trading routine. Knowing the different types of options available are other important starting points in trading options. For example, puts and calls are opposite each other. For this reason, it can be beneficial to stick to either puts or calls when beginning options trading. Calls give the owner the right, but not the obligation, to buy an asset within a specified time frame at a set price. Puts, on the other hand, give the owner the right, but not the obligation to sell an asset within a specified time frame at a set price. Knowing all of this (and there is much more to learn! ), should you trade stocks or options? As you can see, there is less to learn when trading stocks. On the other hand, if you want to capitalize on the many benefits options offer, and you have the time to learn about them, you may want to consider trading options. One huge benefit options offer over stocks is that options can be used as a risk management strategy, to generate both income and capital gains, and provide incredible versatility to your trading in the event you get on the wrong side of a trade. I like to say that options allow you to be right even when you’re wrong. Only you can decide whether you should begin with stocks or options based on the time you want to spend learning how to trade and your personal trading goals. Now that you’ve considered if you want to trade stocks vs options, you’ll also want to consider if you’ll trade funds vs stocks. When considering trading with ETFs vs stocks, you get great diversification with ETFs that you just won’t get with individual stocks. This means your trading isn’t subject to unexpected and sudden volatility stemming from issues that affect individual stocks. Examples are earnings news, negative company announcements, or insider buying and selling. On the other hand, advanced traders learn how to trade earnings with more sophisticated options strategies that can work regardless of earnings announcements. In other words, option traders can take advantage of sudden news and events about a company. This is because options allow traders to add a protection arm to their trades. The option premium is another factor that affects whether you’ll be trading ETFs Vs Stocks. If you have a set income goal from selling option premiums, for example, you’ll gravitate toward the securities that allow you to reach your trading goals once you start working with your numbers and projections. Futures bring yet another level of education to your trading. Much like options, they also provide benefits that cannot be found elsewhere. Futures allow traders and investors a way to hedge the future price movement of an asset or commodity. Like options, futures allow traders to leverage their time, capital and energy. Options can be traded most major securities. This may be stocks, ETFs or even futures themselves. Futures, on the other hand, can only be traded on commodity type of assets. Also, futures tend to be more volatile than options. For this reason, if you’re trying to decide whether to trade options or futures, in the beginning, options are easier to trade than futures in my opinion. The big variety of options trading strategies allow you to control your risk more so than futures. For example, to make money on a futures contract, you can only make money if the futures go up within a defined time frame if you own the futures contract. With options, you can enhance a trade by using a loss protection strategy and even get income from that strategy. Options give you options! Options truly allow you to get income, lower your risk by hedging, and use lower capital that is otherwise needed to control a security when properly structured. Not only this, but you can also control your risk based on the type of option strategy you use. Can you tell that I prefer options vs futures, especially for less advanced traders? You may be wondering if swing trading vs day trading is better for you. Swing trading involves placing trades with the plan to profit over a period of at least several days. Longer swing trading can last for weeks, or even months. Day trading involves placing trades that are closed out on the same day. One common strategy used by traders, especially during uncertain economic times, is extremely short-term day trading where transactions are closed out quickly. This is known as scalping. Another factor in selecting swing trading vs day trading is whether you want to have positions open overnight. Many traders sleep better if they close out their trades on the same day they were placed. This same trading principle is applied even more so over weekends. A lot can happen in the international markets now that strongly affect the US market. In choosing swing trading vs day trading, the amount of time you have to devote to trading is an important factor. Swing trading is more suitable for traders who work full time. Day trading can work well for traders who work part-time or who are off for days at a time. My trading club, for example, has had many emergency room doctors since they work unusual hours and are off work for days at a time. We also attract technology experts, such as engineers and IT focused on men and women. Trading tends to attract smart, analytical people, such as doctors and engineers who welcome the brain stimulation on their off days or want to work a little during retirement. In choosing swing trading vs day trading, most trading club members find what works best for them after they start trading. My suggestion is to paper trade the simplest, lowest risk trading strategies in the beginning, and see what works best for your personality and schedule. Focusing on trading income vs capital gains is another decision that will affect the trading strategy you choose and, hence, how to get set up as a trader. One advantage of options trading is that a trader can make income vs. being limited to only capital gains. Using a very simple example, a beginner trader or investor can sell options on stock holdings. The beauty is that the income from selling the call options immediately goes into your brokerage account no matter what the underlying security does. This is a perfect example of trading income, although it’s really investing income, more so, due to the simplicity and common practice by investors. In another post, I explain the various outcomes from selling these call options. Another advantage of options trading is that you can sell the option based on the outcome that you want, as you can read in my article How to Trade Options 101 by clicking here. Selling out of the money covered calls is a great strategy for owners of stock that want to generate income beyond the dividends, especially if you want to hold the stock anyway. There is another advantage in that covered calls can be done in an IRA. This removes the tax problem from creating a capital gain if a profitable stock gets “called away” unexpectedly. If there are no taxes involved, an investor can just buy the stock back, especially with trading commissions as low as they are nowadays. The main point is that covered calls are an excellent way to understand how you can get income from selling options. Again, covered calls are more of an investment strategy and less of a trading strategy. Their simplicity makes them an ideal option trading strategy for beginners. Capital gains from trading, on the other hand, comes from buying and selling a security at a profit. This security may be a stock, ETF, or an option. The time it takes to generate that capital gain is determined by whether you are day trading or swing trading, as explained above. The answer to how much money you can make trading stocks is based on several factors. The simple answer is that you can loose your shirt or you can make a ton of money or land anywhere in between! Nothing worth doing happens without effort. While trading from home can definitely beat the time and energy required for an 8 to 5 plus job, for a boss you may not like, trading takes effort. Having said that, some of the most successful members in the Power Cycle Trading Club set a firm goal for the day, and when reached by 9 a.m., they are done for the trading day. Just like the number of stock dividends that you’ll receive is a factor of the underlying capital invested in stocks (and the yield), the amount of money you can make from trading options is dependent on the capital in your trading account. While leverage is certainly a factor with options trading, the value of your account is a larger factor in determining the results you can achieve. If you think you’ll loose money trading the probability is much higher that you will. If you think you’ll be a successful trader, the probability is much higher that you will. One thing that increases the probability of trading success is to use trading setups that create high probability. This seems so obvious, but it’s easy to lose the site of this fact in the excitement and emotions that can erroneously be tied to trading. This high probability realization is what led me to develop the Power Cycle Trading model based on a slight obsession with increasing the probability of trading success by combining a certain set of technical indicators with specific settings. I address how much money you can make trading options as a separate issue due to the nature of options. The good thing about trading options is that options provide leverage of your time, energy and capital. This means that you can make roughly the same amount of money trading options that you can make from trading stocks but multiply it for options trading. Therefore options trading is finally becoming very popular after over thirty years of existence. Remember that if you can multiply profits from options trading vs stock trading, this same principle applies to losses. 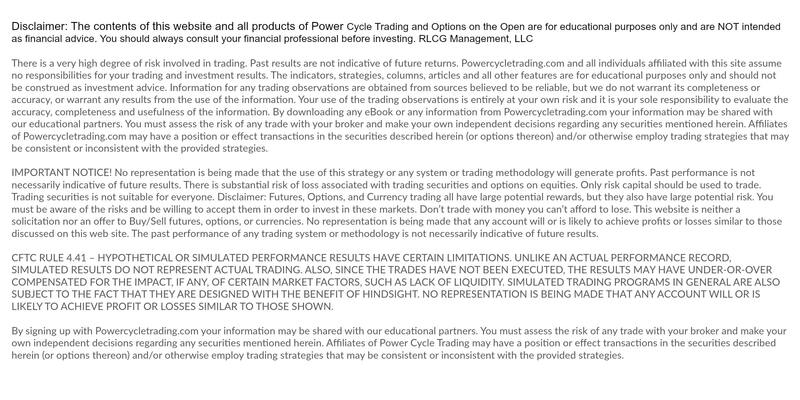 This is why risk management is a primary focus at Power Cycle Trading with the use of hedging techniques. The amount of money you will need to start trading stocks will be a factor of your decisions about how much of your net worth you choose to allocate to your trading account and your decisions about what to trade starting out. Once you have made all of the decisions addressed above, you can call your broker and ask their margin requirements for being an active trader if you have decided to be a day trader. If you want to sell an option when you don’t own the underlying security, you’ll need a margin account. A margin account will require you to have higher levels of cash in your account. On the other hand, you can purchase options to open a position in a cash account. Again, like anything else worth doing, it takes time to learn to trade stocks. I have found that the real question is “do I want to learn to trade stocks?” If the answer to this question is truly yes, then you’ll take the time to make it happen. Start learning how to trade with the simplest strategies. Then, if you choose to become a more advanced trader, you can. I will say that most committed traders want to learn how to trade options once they have seen the advantages of options trading. Should you decide to learn how to trade options, learning how to sell a covered call is clearly faster than learning how to trade a butterfly spread. If you don’t have the budget for a stock trading education program, you can find a lot of free trading information online. This will take longer than learning how to trade through a program, but it can still work for someone who is committed. The other determining factor in the time required to learn to trade is whether you’ll be using technical analysis. If you learn how to trade with technical analysis indicators, you’ll want to put in a good amount of time learning the various indicators. You’ll need to tweak the settings on each of them to increase the probability of trading success. There are some technical aspects of charts that you’ll want to know such as support and resistance and how to draw trend lines, at a minimum. There are other useful tools to know which can increase your trading success probability, such as Fibonacci and moving averages. After years of working with various technical indicators, I finally created my own technical trading model to save time for my clients. Only you know what will work best for you. If you like to get in the trenches and do things from the ground up, then you’ll like learning how to trade with technical analysis and getting it just right. If you’re short on time and want to cut to the chase, you may want to get a model that has already been tweaked and developed by an experienced trader. Based on your many decisions above, write a business trading plan. Your business plan will include all the elements of most any other business plan, such as capital, time commitment, hours and resources. This will lay the foundation for trading as a business and not a frivolous pursuit that temporarily holds appeal. A trading plan will also lay the foundation for success. There are several considerations for opening an options trading account. You may already have investments at a brokerage firm that you chose for reasons aligned with your more traditional investments. In this case, you’ll probably want to see if this same firm has an excellent trading platform. If you’re wanting to get set up to trade options, you may want to consider opening an account at one of the brokerage firms specializing in options trading. The method of trading you want to do, and your overall trading goals will help determine the best online options trading platform for you. You’ll know more about this after you have taken the steps in this article. Once you’ve opened the brokerage account you’ll use for options trading, you’ll need to get approved by the brokerage firm to trade options. There are four levels for options trading. Here are the levels with each strategy that is allowed under each level. 1st Level – Covered Calls, Long Protective Puts 2nd Level – Long Call/Put 3rd Level – Spreads 4th Level – Uncovered or Naked Puts The least risky options trading strategies are at Level 1, as you can see. Trading at Level 1 is generally allowed in an IRA account as long as you own the underlying stock first. 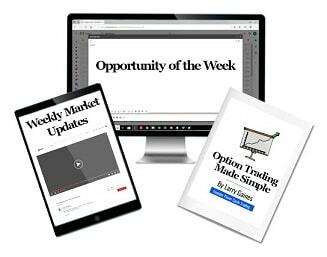 If you want to know more about the various trade setups above, Click here to get my Options Trading Made Simple eBook outlining all the different options trading strategies, my Option Strategy Cheat Sheet and more cool tools I created. The great thing is that you can practice trading long before you risk any of your money. Practice trading is known as paper trading. This will allow you to dip your toes into the water without any risk. This doesn’t happen often in the financial world, so I highly encourage paper trading. It lowers your trading risk significantly. Most brokerage platforms allow you to trade in “demo” mode. With demo trading, it’s just like you’re really trading, only you’re not. You’ll want to make sure that you choose a broker with this feature. As you can see, you have some decisions to make before you can get set up to start trading. Additionally, you’ll want to create your own rules that work for you. This may be your first time “working” without a manager or corporate structure. For this reason, set work hours, financial goals, and rules for accounting for your trading. Thanks to demo and paper trading, you can get started without risk to see what works for you. Plus, you can see the type of trading that you like and don’t like. One of the advantages of trading is that you get to do something you enjoy with the intention of making money, so you may as well choose a trading strategy that suits your desired lifestyle. Forgive the pun, but, fortunately, there are many good options for trading.